Pierce Flynn, Park Hotel presents the September Waterford Sport Star Award to Joe Gough. Included are Rachel Kinsella, Sales & Marketing Manager, Park Hotel, Fintan Walsh, Waterford Athletics PRO and Kieran O’Connor, adjudicator. Photo: Sean Byrne. 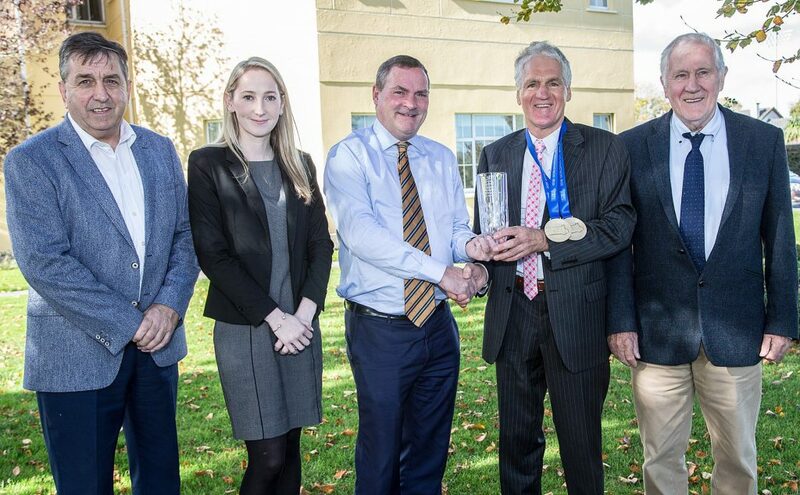 There was a bit of history made at the Park Award Waterford Sports Star Awards this week when the sport of athletics became the first sport to reach 50 monthly awards of this prestigious awards scheme that has been in existence since 1991. The man to bring athletics to that historic milestone was none other than West Waterford AC star, Joe Gough, who collected the monthly award for September. Joe was winning his fifth Park Hotel Award after he claimed a wonderful gold medal double at the World Masters Athletics Championships in Malaga, Spain. It began with the Over 65 800m title which he won in a new European record time of 2.16. 38 seconds. Four days later he was back in action in the 1500m final and again he was in top form beating the old Irish record time for the event by five seconds on his way to a famous winning double clocking a winning time of 4 minutes 49.63 seconds to claim his first World Championships gold double. “I’m thrilled to be here today to collect my fifth Park Hotel Award. It’s such a prestigious award and it’s something that every sports person in Waterford would love to have and I’m humbled and privileged to now have five of these great awards. Having won his favourite event, the 800m, in a new European record time, Joe then went on to qualify for the final and then win the 1500m, did getting the 800m take the pressure off or add to the pressure? So how did it feel standing on the podium receiving those gold medals? You only have to meet or listen to Joe to know that he’s enthusiastic as ever for the sport and the hard work that goes with it. What drives him on to keep going? Joe’s double caused great excitement in Waterford and this monthly award means that athletics becomes the first sport to win 50 monthly Park Hotel Awards. What does this mean to Joe? Joe received his award from Pierce Flynn, Park Hotel proprietor and Kieran O’Connor represented the adjudicating panel. Fintan Walsh, PRO of the Waterford county athletics board was also in attendance.